If you are a beginner and plan to start saltwater fishing, it is good to be equipped with a little knowledge, a thing or two to get you going. These basic information mainly includes the type of rods and fishing reels needed, saltwater knots as well as type of fishing baits to use in the ocean as they completely vary compared to freshwater reels. There are two types of reel which are the baitcasting and spinning reel. The spinning reel is generally simpler to operate and suitable for beginners whereas the baitcasting requires a little extra skill to land the bait directly on your target. The spinning one prevents the line from getting tangled meanwhile the baitcasting one makes it suitable for long distance casting or to fight heavy fishes. 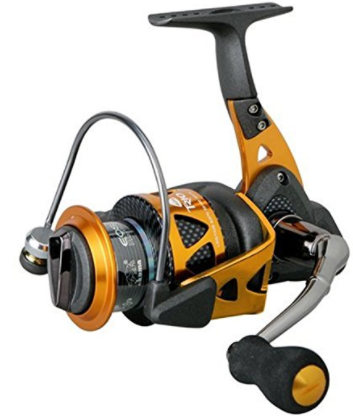 The best saltwater reels varies from the usual fishing reels as they are designed especially to be utilized in saltwater areas such as the ocean. Hence, they are constructed from corrosion-resistant materials since the salt in the sea is highly corrosive. Apart from that, they have a sturdy construction so it is able to absorb and handle strong impacts of the rocks and debris underwater. That being said, it has a lot more additional features such as the material type and strength to make it usable in saltwater compared to the freshwater or general fishing reel. There are two types of reels out there, which are the spinning(check out spinning rods too!) and baitcasting reels. The spinning one is generally a whole lot simpler than the baitcasting one. Baitcasting is suitable for fishing at longer ranges and to land a large fish. They are preferred by experienced anglers as this type of reel require skill and experience in handling them. That being said, this technique will land you directly at your target, and you will have a higher chance of getting your catch. In other words, the line and reel comes off in a straight direction, hence offering greater accuracy when casting. There is no need to replace the fishing line frequently. You can also stop the lure easily, hence preventing bad casts. For the spinning reel, its spooling system refrains the line from getting tangled over the reel. They are a lot easier to cast and are mainly preferred, by amateur anglers and beginners. That being said, it is also one of the most common type of fishing especially if you plan on landing small to medium sized fish. You are allowed to cast different type of lures with this reel type, which includes live baits as well as artificial lures. Since this reel is mainly for saltwater use, the material should be strong and saltwater resistant. It is mostly constructed from alloy metals such as aluminium and stainless steel hardware to ensure that it don’t get rusted from being in contact with the saltwater. This is because salt is highly corrosive, once the water is evaporated from it. Also, the parts of the reel such as the ball and roller bearings, spool and gear should be strong and sturdy to fight the fish you are about to catch. The fishing line on the other hand, either monofilament or braided should be strong so it doesn’t snap easily when fishing out the fishes, whether large or small out of the water. The reel should have smooth working operation, mainly due to the strong and solid ball and roller bearings. The higher the number of ball bearing, the smoother your reel works so it is good to have as many ball bearings in your reel so an amazing fishing experience is guaranteed. Each product comes with both braid and line capacity rating, usually measured in yards and lb (pounds). For example, if it has a rating of 260/30, it means that it has 260 yards in length as well as 30 pounds. Hence why you should always choose the right fishing line, whether monofilament or braided to support the fish you are about to catch, without any scenario of the line snapping. The higher the line or braid capacity, the higher chance you have to catch larger fishes. Apart from that, the capacity is usually determined by taking into consideration the spool size and weight. If you plan to use braided line on your spool, you usually require a backing using a monofilament line. However, newer products with improved quality and additional features such as the Penn Spinfisher is equipped with a superline spool that doesn’t require any backing. Hence, you can utilize the braid capacity measurements and hence, the braided fishing line with maximum ease. It is important to invest in a good and high quality saltwater reel. Whether baitcasting or spinning ones, it is up to you according to your preference and skills. The price basically varies depending on the additional features and construction materials of the product. You should be willing to spend a little extra bucks in order for a promising and excellent product, for a long-term investment. However, do not let the price fool you! Not all top rated products are deemed expensive. That being said, not all expensive ones are the best meanwhile not all cheap ones are the worst. So, you should spare some time to research on the type of reel well-suited to you. In my humble opinion, it is best if you go through customer reviews as well as product-based reviews. This product features a high end and heavy duty offshore saltwater spinning reel. It comes with a mono line capacity (lb/yards) of 12/345, 16/250 and 20/185 and, with a powerpro line capacity (lb/yard) of 40/340, 50/265, 65/215. Hence, with these measurements you can choose the right line size to fit your reel with ease. Weighing 23.8 ounces, it has a maximum drag force of 62 pounds and a line retrieve per crank measuring 42 inches. Therefore, catching a large finish with around 30 to 50 pounds in weight won’t be an issue for you since the drag force is powerful enough to handle it. Apart from that, the increased coil wave spring and the washer size comes in handy as it continues to ensure that the drag force is consistent at each setting and mainly, for the full duration of the fight so you have a high chance in landing the fish. Its X shield, X protect gasket and finally the rubber on the other hand keeps the saltwater intrusion at bay. This is important as it reduces the area of the gear being in contact with the saltwater, thus preventing corrosion of it in the long run. The single piece aluminium shaft is equipped with a stainless steel core so you have more power under load to give a good fight to the fish. It also includes a rigid aluminium handle so you are able to retrieve giant fishes such as the Bluefin tuna or massive dogtooth out of the water with enough power and maximum convenience. Furthermore, it can easily cast both heavy and high resistance lures such as stick baits as well as jigs with maximum accuracy and efficiency. Once you get hold of the casting technique, you will get a hang of it better, if you are a beginner. The high accuracy of the lures being casted is due to the additional impressive features of this product. Those additional features include the X rigid motor and the SR single piece titanium bail arm wire. The SW diamond like carbon bail roller on the other hand contributes to the excellent efficiency of the reel as it successfully cuts down the heat buildup on your lines hence preventing it from snapping. Speaking about bearings, this saltwater reel has a 14 SA RB bearings as well as a roller bearing to ensure smooth casting and retrieving of your catch with ease. Designed with high-level integration of power and smoothness in mind, this product ensures very smooth and powerful casting for your convenience. This Abu Garcia fishing line is equipped with a Rocket Line management system which delivers a long-range as well as accurate castability of your bait with line towards your target, with all types of fishing line, might I add, according to your preference. Its slow oscillation on the other hand ensures even line lay at all times. Apart from that, its Rocket Spool Lip design controls the rate at which you desire the line being released from the spool to ensure the maximum casting accuracy. This feature comes in handy as you are one step closer in landing yourself a big fish in due time. Equipped with a sturdy aluminium construction, it comes with perfect and accurate gear alignments due to its precision-machined gears, therefore you can quickly retrieve your fish from the water with a good fight. That being said, the X-Mag alloy gearbox and C6 carbon construction ensures that your product is highly durable without any excess weight. The unparalleled gear performance is made to work with an innovative computer-optimized design. Thus, this durable spinning fishing reel is fully engineered for flawless gear alignment and robust cranking to improve your fishing experience. Furthermore, this product is rather light, weighing 13.6 ounces. Its small and compact size doesn’t weigh down your whole fishing rod hence, it doesn’t strain your arms if you plan on fishing for long hours. The lighter weight can compensate for the other weight such as rod, bait and spool so the overall weight is rather fine for you. If you prefer braided fishing line over the monofilament ones, you are able to utilize it according to your preference using the included machined aluminium braid ready spool on the reel itself thus, the braid can be directly tied on it with maximum convenience. The carbon matrix feature on the other hand further enhances the drag system meanwhile the K-Clutch anti-reverse bearing prevents your handle from backplaying so you can continue cranking easily and smoothly, without any interruption. Not only that, it is equipped with 11 stainless steel HPCR bearings as well as a roller bearing to ensure that you cast and retrieve smoothly. In other words, it offers long-lasting durability and smooth operation that will benefit you in the long run. However, keep in mind that you should frequently oil the bearings to ensure it runs smoothly without any scenarios of the reel getting jammed. It includes large EVA knobs and an extended bent handle to provide you with ergonomic grip, and to further ensure smooth operation. This spinning reel features the precision dual force drag system (DFD), providing your product with an excellent stopping power. In other words, the drag is smooth and consistent as well as can be cranked up to major poundage for good stopping power, especially to fight large fishes. It is specifically designed for saltwater use, however it is a good practice to rinse it each time with freshwater after use, to ensure its durability in the long run. It is constructed using rigid aluminium body and rotor that are resistant to corrosion. Also, it is rather versatile as it can also be used in freshwater areas according to your preference. If you’re left-handed for instance, there is a special handle adaptor (included) that can be changed so you can swap it to the opposite side conveniently. In other words, this product comes with a conversion main shaft that switches it from the right to left hand or vice versa, therefore it is very user-friendly, in my opinion. Apart from that, it includes a die cast, rigid aluminium frame as well as machined-aluminium anodized spool to provide further protection against corrosion, due to its aluminium construction. The spool on the other hand has a smooth operation as it prevents tangles and knots on your line, therefore making it fairly easy to cast and retrieve when fishing. The combination of the customized jigging handle and the high speed gear ratio makes this product is desirable and one of the top selling unit in the market, hence it is well worth your investment. In terms of finish, it has an attractive and vibrant appearance. 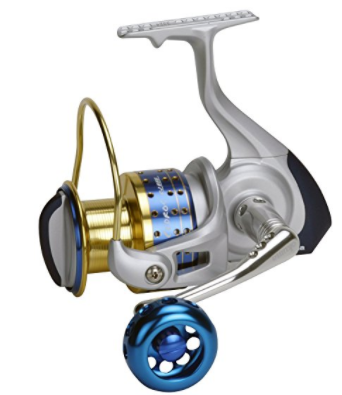 The high speed reel is equipped with silver handle and blue knobs meanwhile the low speed and bait feeder ones comes with both blue knobs and handles. Not only that, it has a mono line capacity of 10, 12 or 15 pounds so you can choose based on the size of the fish you are planning to catch. If the fish you are planning to catch is large and heavy, you should go for the highest line capacity so you can retrieve them out of the water with ease. Moreover, its high density gearing feature has a special corrosion resistant coating that comes in handy especially for saltwater fishing. Its additional features also include having a patented elliptical oscillation system as well as a quick-set anti-reverse roller bearing to prevent the backplay of your reel. All in all, this product has an excellent build quality and drag system as well as suitable in landing a big fish. Weighing 6.4 ounces, it features the Carbon Matrix drag system which comes in handy to provide ultimate smooth drag performance at all times. Apart from that, it uses the baitcasting technique instead of the spinning one, in which makes it ideal to fish out heavy fishes. The line on the rod and reel comes off straight, allowing for a greater casting accuracy. Moreover, it comes with a compact bent handle and star which provides an ergonomic design so you can grip onto it conveniently when retrieving during fishing. Its line capacity measures 10/170 meanwhile the braid capacity measures 30/160. The maximum drag force on the other hand is 15 pounds. The recovery is 25 inches per turn whereas the gear ratio is 5:3:1. This product is suitable for right-handed users as the crank is located on the right side of the reel so you can hold it conveniently while fishing. It is equipped with 3 stainless steel ball bearings as well as 1 roller bearing, providing a smoother working operation so it will least likely get jammed or so. All in all, this baitcasting reel is said to offer superior performance and unrelenting power. Besides that, it includes a 6 pin centrifugal brake which ensures that the brake pressure is always consistent throughout the cast. Hence, it will have an excellent stopping power for smooth casting and retrieving. Also, it has a synchronized level wind system which comes in handy to improve the line lay and stability. It prevents the tangling of your line so you can cast and retrieve the line with maximum ease as well as least likely to cause your line to snap. In other words, this product is equipped with a chemical nickel coated level wind system and a 3 bearing system. The 3 bearing system on the other hand comes with an anti-reverse feature, allowing for solid hook power settings as well as prevents the backplay of your reel when fishing. In terms of appearance, the C34600 Abu product has a rugged silver finish. It is also said to be very durable hence, in my opinion very worth your investment in the long run. The KastKing Kodiak product comes with an attractive finish in which it has a color combination of silver, gold and gunmetal as shown in the picture above. A little back to the history, it is a powerful and strong spinning reel named after artic bears in Alaska, of their journey to find fish. It has an all aluminium construction, hence making it suitable to be used in saltwater areas since its alloy body are most likely able to resist corrosion caused by the salt in the saltwater. Breaking it down, this product is equipped with an all zero-flex tough aluminium body and rotor as well as a CNC machined aluminium spool. The spool on the other hand ensures easy travel of your line, whether monofilament or braided according to your preference. It further prevents the tangling of your fishing line, therefore making it a whole lot easier in casting and retrieving your target. Furthermore, it is said to be extra tough as it is equipped with a 15 % thicker and enhanced stainless steel main shaft and brass gears to prevent the corrosion of metal when in contact with the saltwater. The carbon fiber drag system on the other hand allows 39.5 lb/18 kg of massive power in order to win the fight against large fishes. That being said, it can easily handle a 30 or 40 lb fish with ease as it has enough power to even handle a 60+ lb tarpon. Imagine the power it has! Weighing 12.4 ounces, it has a max drag force of 39.5 lb whereas a gear ratio of 5:2:1. Besides that, it can be used with both mono and braided line according to your preference. The mono line capacity measures 0.285mm/200m, 0.310mm/170m, 0.335mm/140m meanwhile the braid capacity (lb/yards) measures 14/220, 18/180 and 20/150. With these measurements, you can choose the right size of your fishing line. In addition to that, this spinning reel has a high quality 10+1 shielded stainless steel ball bearing to ensure that your reel works smoothly. The new special design of the aluminium spool and rotor structure on the other hand prevents dirt and liquid such as water and sand from getting into the reel. Strong yet lightweight, it is a heavy duty reel series which in my opinion, is well worth your investment. Its line roller has an excellent design which further reduces twist and fatigue, therefore preventing the line from snapping. Not only that, it comes with thick bail wires to further prevent line breaking as well as ensure that you have a smooth and fluid drag support at all times. The hybrid spool design comes with a sturdy graphite arbor as well as an aluminium lip. In other words, the spool construction houses the drag system in the aluminium drag chamber to provide you to excellent stability and smoothness so you have great castability and retrieval when fishing. In addition to that, this product features the precision dual force drag system (DFD) which comes in handy to ensure consistent drag and excellent stopping power. It utilizes both surfaces of the spool, to improve the drag pressure, efficiency and smoothness when fishing. It has a crossover construction which consists of materials such as aluminium and graphite to ensure higher strength and sturdiness for the hybrid body and rotor design. In other words, the unique crossover construction consists of a solid single piece aluminium reel stern as well as a rotor arm, paired with graphite side plates. However, it is said to be not as durable as it looks. Certain parts of the reel might break easily and you might face problems with the gear, based on my experience. Hence, you can either fix those problems yourself by self-learning on Youtube (which I did) or contact the customer service (they are really helpful and friendly!). When cleaning the reel, be gentle when opening the gear housing since the screws are easily stripped off. Also, the bail won’t close automatically when casted (not stated in specifications that it will anyways), however it still performs fine. Furthermore, it has a great retrieval speed where you get to pull out your fish caught on your bait, out of the water with ease. It is best used for catching smaller fishes, however it still works fine if you plan on getting a few big ones. Don’t forget to clean them frequently. Proper maintenance is highly important to ensure your reel has smoother working operation and stays durable. The cleaning on the other hand is rather simple, you just need to rinse it off with freshwater (to remove the salt once the water evaporates) and properly oil it so it works smoothly with ease. Apart from that, this reel is equipped with 9 ball bearings (BB) and 1 roller bearing (RB). The bearings are constructed from stainless steel material to further resist corrosion, so that it can operate smoothly during casting and retrieving when fishing. The quick-set, anti-reverse roller bearings on the other hand prevents rotor backplay. Penn Spinfisher’s watertight spinning reel performs very well in both saltwater and sand environments. It features a watertight design that successfully withstands the harsh saltwater and further prevents it from being contact with the reel. Equipped with durable aluminium construction, this product breaks down to a full metal body, rotor, sideplates and heavy-duty bail wire. Its superline spool on the other hand doesn’t require any backing, therefore you can conveniently use the braided fishing line, without a monofilament backing according to your preference. Apart from that, the spool is braid-ready and is equipped with line rings marked at 1/3, 2/3 and full capacity, thus prevents slipping under pressure so you have great grip on the handle. In addition to that, it has a mono line capacity (yards/lb) of 330/12, 300/15 and 210/20 meanwhile the braid capacity (yards/lb) measures 420/30, 340/40 and 280/50. Weighing 22.3 ounces, it comes with a maximum drag weight of 30 pounds and has a gear ratio of 5:6:1. The retriever rate on the other hand measures up to 39 inches. You are advised to get the Berkley or Spiderwire Superline fishing line to accommodate the reel perfectly, taking into consideration the mono line and braid capacity. Furthermore, fluid cranking is provided with this sturdy spinning reel. It has 5 shielded stainless steel ball bearings paired up together with an instant anti-reverse bearing. The anti-reverse bearing eliminates rotor backplay so you can handle it conveniently, in which you just need to set the hook and reel with ease. Its large diameter drag knob on the other hand ensures that you are able to seamlessly crank down to the maximum drag without the lines snapping due to too much tension. Each drag washer is treated with grease to provide smoother working operation, hence ensuring a quick, easy and long-lasting performance. It is equipped with a sealed HT-100 slammer drag system. The system provides smooth and consistent drag while its friction ramp on the other hand prevents premature bail trip when casting. Thus, it results in accurate casting with maximum ease. All in all, the Spinfisher offers long-range castability as well as excellent fish-stopping power so you can even fight large fishes. Keep in mind that you need to take into consideration the size of the fish, it should be below its maximum drag force (<30 lb) so the line doesn’t snap from too much force. Saltwater reels are important especially if you are fishing in the sea, compared to the conventional reel because they are constructed from mainly stainless steel and aluminium materials which are resistant to corrosion. The salt from saltwater is highly corrosive once the water have evaporated, hence why it is important to give your reel a good rinse each time after use. Choose the best one, well-suited to you so you can have a durable and long-lasting reel. Hence, I hope my review assists you in making the decision. Happy fishing and don’t forget to get your very own fish finder to assist you!